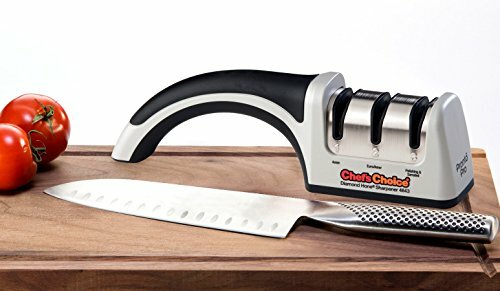 Chef’s Choice is a big, reputable name in the knife sharpener industry. So which Chef’s Choice knife sharpener is the best? You’re in luck because we’re on the lookout for the best Chef’s Choice knife sharpener and we’ve rounded up these seven options that get the job done. A dull knife is a chef’s nightmare. 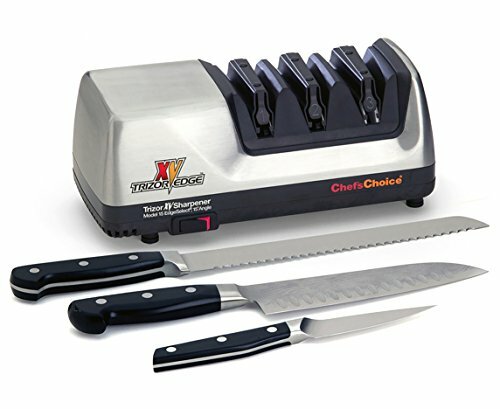 Chef’s Choice 15 Trizor XV EdgeSelect Electric Knife Sharpener combines the Trizor edge with the ultra-sharp 15ºXV technology for strength, durability, and flawless sharpening. Its 3-Stage EdgeSelect system provides the perfect edge and works for both straight edge and serrated blades. The 15 degree angled edge allows for maximum performance and cuts more easily than a 20 degree angled edge. It features spring guide for accurate control of the sharpening angle and ensures ultra-sharp edges in no time! Precision angle control for Trizor-Plus edge. Chef’s Choice Diamond Hone Edge Select 120 has a three stage sharpening process which flips on and off with a switch. The unique trizor plus edge provides with durability and sharpness to its maximum. It has a three years warranty and works for sharpening of chef, butcher, hunting and pocket knives of all weights and brands. 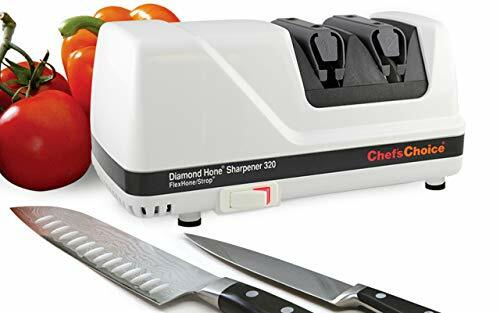 Chef’s Choice Diamond Hone Knife Sharpener 320 has a hundred percent diamond honing which has lifetime warranty of and will never distemper. In order to ensure robust and hard-pressed sharpened edges a two stage sharpener has been installed in this electric sharpener. What makes it the best Chef’s Choice knife sharpener is that it can be used to razor edge all quality knives. The precision of sharpening is almost one hundred percent as it is aided by a built in elastomeric spring guide which holds blade at the appropriate angle. You can also read our detailed review of Chef’s Choice 320 Diamond Hone knife sharpener. 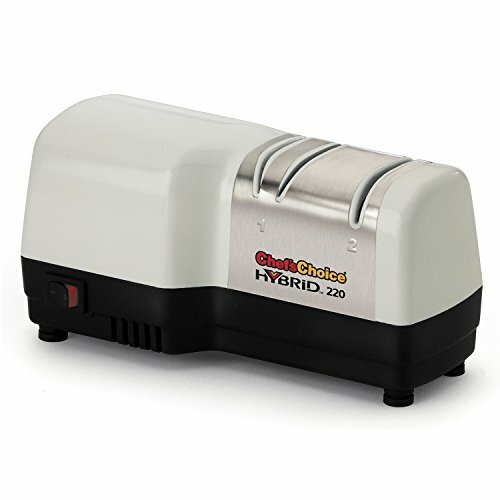 Chef’s Choice Hybrid Diamond Hone Knife Sharpener 220 combines a manual and an electric sharpener for generating razor sharp ends. It can be used to sharpen all quality knives both straight and ragged edged. The electric stage is to sharpen the knives whereas the manual is to polish them. The hundred percent diamond abrasive wheels are used in both the stages. It creates burr-free edges quickly and easily. The Chef’s Choice Hybrid Diamond Hone Knife Sharpener 220 comes with a one year warranty and is probably the cheapest best Chef’s Choice knife sharpener. Bevel angle control for 15 & 20 degree edges. Chef’s Choice Pronto Pro Angle Manual Sharpener 4643 is a three stage manual sharpener that can be used for kitchen, pocket and sports knives. The three stages use hundred percent abrasive diamonds. The first two steps sharpen the edges while the third refines the blade. It is compact, lightweight, and easy to use; with a secure handle that ensure firm grip. Chef’s Choice Diamond Hone Hybrid Knife Sharpener 250 has one year warranty and is probably the best Chef’s Choice knife sharpener available for an affordable price. As per hybrid technology, it combines both manual and electric steps for sharpening the knife. The first two stages use electricity for sharpening the knife. Manual power is then required in the third stage to hone the knife to perfection. Ultra-thin diamond abrasives assist the physical power in order to achieve the best possible results. Jagged and straight both edges can be sharpened and honed. Sports, hunting, kitchen, pocket and butcher knives can be re-sharpened to apt using this gadget. 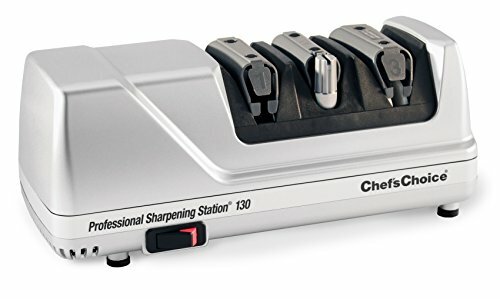 Chef’s Choice 130 Professional Knife-Sharpening Station professionally sharpens and strops most types of knives. This products works for straight edge and serrated knives alike. The 130 Professional Knife-Sharpening Station features 3-stages. In stage 1, the 100% diamond abrasives sharpen the entire edge of the knife, stage 2 can be used to maintain a consistent razor sharp-steeled edge, while stage 3 creates an ultra- sharp fine edge. This knife-sharpening station comes with a limited 3-year warranty. 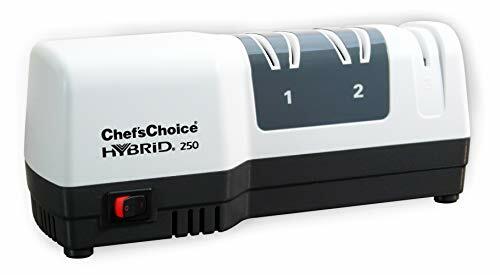 If you are already decided about going with Chef’s Choice for your next knife sharpener, I hope this guide helped you choose the very best Chef’s Choice knife sharpener ever made according to your own specific needs. If you have anything in mind, or if you know of an even better Chef’s Choice knife sharpener that we didn’t list in this round-up, feel free to leave a comment below. 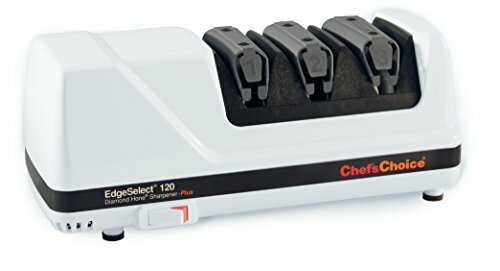 Chef’s Choice model offers a lot of options if you want to get different types of edges .This electric knife sharpener is not only a great tool for chef’s, but also very useful for home kitchen use.Thank you for this very useful information.With so many different types of Knife Sharpener to chose from we should consider the following information.